I'm definitely a fan of patterns, and the bolder the better! Although I have a wide range of patterns hanging up in my closet (more than I can count! ), certain patterns draw me in more than others. Take, for example, geometric prints: I love how modern they look, such as this bold Geometric Print A-Line Skirt from SheIn. 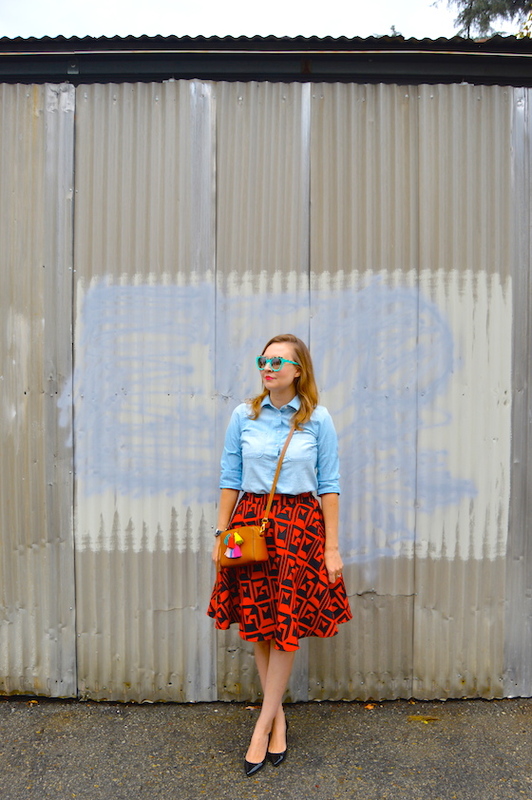 I wore this skirt on a rather drab and dreary day last weekend in Los Angeles and it definitely brightened my day! 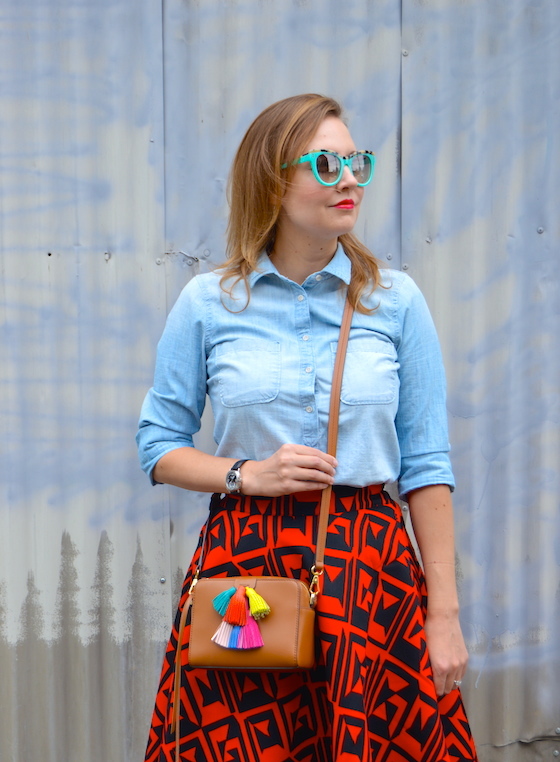 Even though this skirt has a modern, geometric print, I decided to go in a different direction in the styling of the skirt this time around by pairing it with some slightly Western-inspired items, namely my chambray button-down shirt and my trusty tassel bag. Of all of the bags that I've purchased over the last couple of years, this tassel bag from Rebecca Minkoff is the one that I seem to come back to again and again. I pretty much take it everywhere with me because it goes with pretty much everything! I also found a budget version of the bag that recently came out from SheIn, which you can find here for only $25! this look is so chic! I love the print on the skirt and the tassels on the purse. Beautiful combo and I love that RM bag! Thanks so much for sharing with Fun Fashion Friday! Have a fabulous weekend! Such a great skirt! Love how you styled it! Such a fun skirt! I love that little tasseled bag! Oooh..I have a skirt almost like this-but haven't paired it with my denim shirt yet!! 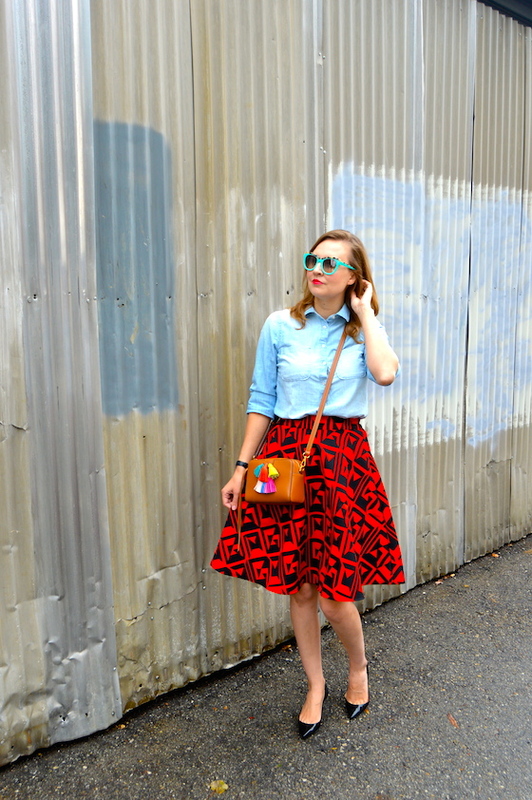 Not only I love the print of your beautiful skirt, but I also love the shape! Absolutely gorgeous on you!! What a stunning dressed up casual look. 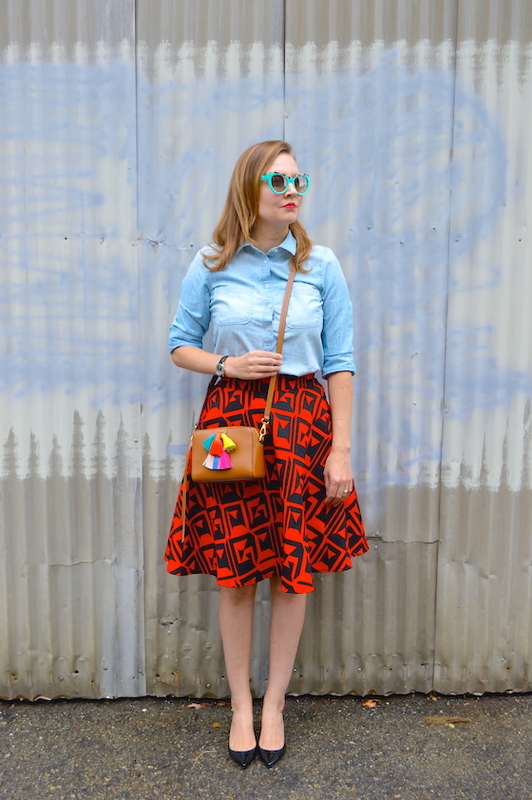 I love chambray tops on top of skirts or dresses.